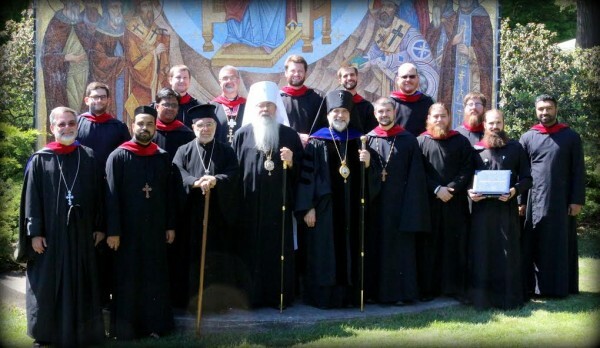 Saint Tikhon’s Seminary here held its 73rd Commencement on Saturday, May 23, 2015. His Beatitude, Metropolitan Tikhon presided, offered the Commencement Address, the text of which appears below. He also awarded Master of Divinity Degrees to 13 graduate, including those from India, Austria and the middle East. Deacon Theophan received Honors in Church History for his thesis, “The Myster of Lawlessness: A Pastoral Examination of the Manifestation of Evil in Contemporary Society. Archpriest Daniel Donlick, who had just celebrated the 50th Anniversary of his ordination to the priesthood, was awarded an Honorary Doctorate in recognition of his decisive role in moving the seminary toward accreditation with the Association of Theological Schools and his decades of service as professor, academic dean, and confessor that continues to the present day. A scholarship also was named in honor of Father Daniel. Participating in commencement exercises were two new board members: Nancy Kohudic, who is a member of the Diocese of Philadelphia and Eastern Pennsylvania and an ardent supporter of the seminary’s Married Student Housing Project, and His Grace, Bishop Thomas of the Antiochian Diocese of Charleston, Oakland and the Mid-Atlantic, a long time supporter and friend of the Saint Tikhon Community. As we come to the conclusion of this academic year, I offer my congratulations and best wishes to the graduating seminarians of the class of 2015. My congratulations to you are not simply accolades for a job well done during your years at Seminary, although the many recognitions your class has received today is testimony to your accomplishments both individual and collective. Rather, my congratulations come to you in the form of a blessing: a blessing from your Rector and the Holy Synod of Bishops, a blessing from your Dean and the Administration, Faculty, Staff, Board of Trustees and Alumni of the Seminary, a blessing from the Church, to begin in earnest your apostolic ministry. In the academic world, commencement addresses typically focus on the new beginning of the graduates, the horizons that are opening up, the challenges that they will face. The speaker will, often with humorous anecdotes or clever phrases, encourage the graduates to be true to themselves, to make an impact, to be daring and creative, to pick themselves up when they fall and above all, to be successful. I will offer my own similar words of encouragement today, but I thought it might be helpful for us to reflect somewhat on the reality of our Orthodox Christian context for today’s ceremonies. We are here, in the year of the Lord 2015, fifty years after the repose of the ever-memorable Metropolitan Leonty, who is buried right behind us. We are here 100 years after the repose of the recently glorified Saint Raphael of Brooklyn. We are here 111 years after the founding of the Monastery by Saint Tikhon of Moscow and 221 years after the arrival of Saint Herman the monastic missionaries to Alaska. Orthodoxy in North America is young, in some cases younger than some of the more venerable institutions of higher education in North America which are also holding commencement exercises. But while those institutions can perhaps place themselves within a longer history of the noble pursuit of knowledge and research, only you, as graduates this Theological School, as participants in these 74th Commencement exercises, can claim to be graduating within the bosom of the One, Holy, Catholic and Apostolic Church. As such, you are here as brothers in Christ, and all of us are here, as your brothers and sister in Christ, all with the possibility of participating in and experiencing eternity, here, where we are. This is no small blessing. I myself recently returned from a trip to the ancient Church of Georgia, which traces its origins to the Apostle Andrew and to missionaries of the early centuries such as Saint Nino, the Equal to the Apostles. It is humbling for someone from North America to enter this ancient world and to behold the wealth of expressions of a real and solid Christian faith, with the witness of brave martyrs, ascetic monastics, saintly bishops and priests as well as faithful artists, teachers and scholars. The question arises: can such experience be incarnated in our lands and in our lifetime? And if so, how is this accomplished? This is what your task, as graduates of this theological seminary, whether you are ordained or not, will be for the rest of your lives: to seek to enter into the experience of the saints and to draw others to that experience through the life that you lead. On my return flight from Georgia, I watched a 1997 movie called “Contact,” starring Jodie Foster and Matthew McConaughey. The movie is based on a novel of the same name written by the famous astronomer and scientific popularizer, Carl Sagan. I will not go into the details of the plot of this movie but will note that it centers on a scientist whose work is devoted to the Search for Extraterrestrial Intelligence. She is chosen to be the one to make contact an extra-terrestrial intelligence when strong evidence of its existence is discovered. This scientist, who does not believe in God, is sent in a special machine through various wormholes and other astronomical entities and somehow enters into contact with something “not of this world.” Upon her return to earth, she is, ironically, unable to convince the scientific community of the reality of her experience because there was no scientific record of it. Religious leaders in this movie are portrayed with the usual range of modern skepticism, from violent to unenlightened to simple people. I mention this simply to note that, in our Orthodox understanding, the experience of the saints can very much be considered a scientific experience. Often, science and faith are opposed in our modern world, but if we look at the millennial witness of the Church, we see that, in fact, everything is empirical, that is to say, mystical. Mysticism is not something unreal or imaginary, or “dreamy or vague thinking in the clouds.” Rather, it is, in the words of Saint Nikolai (Velimirovich), “the science of the highest realities.” It is what Saint Paul is referring to when he says that we look not at the things which are seen, but at the things which are not seen; for the things which are seen are temporal; but the things which are not seen are eternal (II Corinthians 3:6). But when Saint Paul says this, it is not with a philosophical background of dualism but with the foundation of Jesus Christ, Who is the incarnate Son of God, the Second Person of the Trinity and the Source of our salvation. The only way for us to enter into this reality is through our own experience, with the help of the experience of the Church and the Grace of God. So while our spiritual life should not be likened to a scientific experiment, it nevertheless is a way to train our soul to participate in higher realities. Each of you, the graduates of the class of 2015, has had three or four years of learning about such things, and I am not prepared to summarize all that you have learned. However, I would just remind you that those years of learning were not simply the acquisition of knowledge but, in fact, part of your path to entering into the experience of the saints. Through the temptations that you have endured, through the struggles with your brothers, through your effort to stay awake in class, to pray with attention while distracted by your children, to care for you family while overwhelmed with classwork or field education, through your questioning whether you in fact, truly love your brothers or will perpetually be annoyed by them, through all of these ways, you have entered into the experience of the saints, that is, you have drawn closer to Christ your Master and Lord. Jesus Christ is the fulness and foundation of everything, He is our Lord, God and Savior, Jesus Christ. The Church is not something in the past, nor something in our imagination, or something only in our mind. Rather she is an expression of His glory, the glory of the Kingdom of Heaven here on earth. The Church is the witness of the reality of the victory of life over death, and the place where every human being can find salvation and healing. All of this is brought about by our Lord Jesus Christ, experienced by saints, martyrs and holy men and women throughout the ages and offered to us today, in our modern age and in our new world. He is why each of you came to seminary and it is for His sake that each of you is now sent forth as His Apostles. Do not forget Christ. This is my first exhortation to you. It is precisely when we enter into this experience, even in a very small way, even imperfectly, that we come to understand what ancient Christianity is and what it can mean for us today. Do not stop seeking your own healing. Our Church is founded on the premise that the ultimate goal of Christianity is deification: “God became man so that man might become god.” By uniting the Divine Nature with human nature, Christ brought man back to his primitive state and, beyond this, made it possible for man to become god by grace. You have not spent these years in seminary to learn to judge your brother or to condemn yourself. Rather you have started to learn, even if imperfectly, how to use the tools of our Christian asceticism in order to benefit from the salvation and healing wrought by Christ and to fulfill the potential given to you in baptism. As you leave here, you must support the monastic life, not only here at the monastery that helped to form you, but wherever it may be found and no matter how small its presence may appear. Make time in your busy schedules to make pilgrimage to a monastery, to remember the ceaselessly praying monastics in your own halting prayers, and to slowly strive for the inner peace and hesychia that the monastics offer to you as a gift and as an inspiration. Be Creative. The Orthodox Church is often portrayed as static, reactionary, ultra-conservative, slow to change and archaic. All of these are inaccurate because they do not address the fundamental creativity of the Church, a Church which continues to be guided by the Holy Spirit. If you truly enter into the experience of the saints, you will become more, not less creative, in your work and in your ministries. Of course, this requires much discernment, but do not fear the true creativity that reveals not yourself, but the glory of Jesus Christ. A contemporary ascetic of our own day, Archimandrite Aimilianos of Simonos Petras monastery, write the following concerning Saint Herman: “[Saint Herman] knew that if he wanted to spread Orthodoxy, and if he wanted himself to become rich, that he would have to make himself small. If he wanted to become rich in the good things of God, then he himself would have to become poor. If he wanted to be first in the Kingdom of Heaven, he would be last here below. And thus, precisely for these reasons, he became a missionary and chose as his plan and method of missionary work not programs, not learned arguments, nor worldly standards, but instead silence and the desert, silence and prayer. He had learned this from the Apostle Paul who, when Christ called him to go bring the message of the Gospel to the Gentiles, disappeared for almost eleven years in the deserts and in seclusion in order there to absorb the Holy Spirit and so have something to give to people. His prayer was his mightiest weapon. Fellowship with God was its result.” This was echoed in all those who labored after St Herman. This is the hallmark of all true apostolic work. It was revealed by Saint Herman and by Saint Tikhon. It was lived by Saint Raphael and Saint Nikolai of Zhicha. And it was revealed by Metropolitan Leonty, whom we remember during this year, the 50th year of his repose. His vision for the Orthodox Church in America was not a national vision but a vision which he shared with Saint Paul, Saint Nino and all the saints down to our own time. It is a vision that is born out of humility and expressed through the actions of love. Of course, all of our human efforts to attain these gifts will be for nothing if they are not blessed by the grace of God. And yet, we know that we are also called to exercise our free will in helping God to accomplish His divine will. An elder on Mount Athos told me once, in reference to my question about what advice to give to young men who were torn between following the path of monasticism and the path of marriage. His words were, “Sometimes its not so much a question of us doing God’s will but God doing our will.” Once again, this is a paradoxical statement, counter-intuitive to all that we have, perhaps, been taught about obedience to God, but founded on the reality that sometimes we, as human beings, must make a decision in our life, and then our obedience to God’s will lies in persevering in that decision. May our loving and merciful Lord, whose glorious Ascension we celebrate, strengthen all of you to take the path that is laid out before you with boldness but with trust in God. May you express the ancient tradition of the faith in creative ways. May you always strive to enter into the experience of the Saints with humility but with perseverance. And may our merciful God fill you with His love and compassion for all of mankind. Amen.